Chocoholics rejoice! 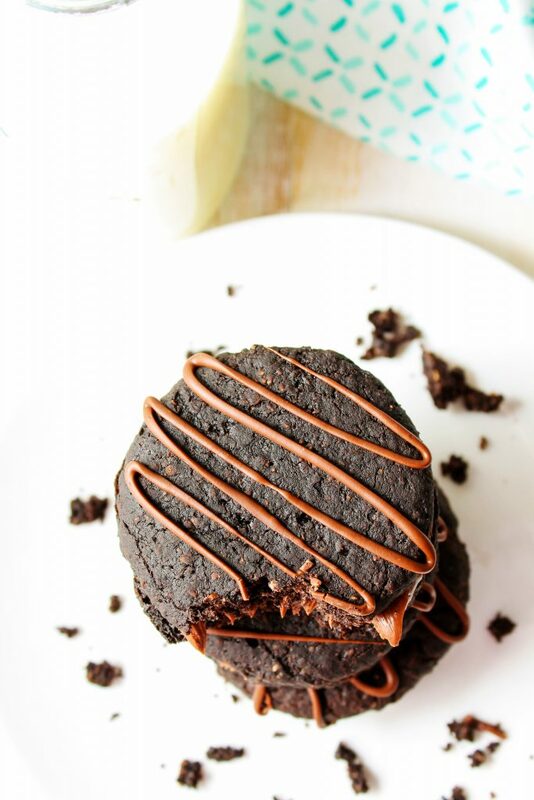 These health-ified chocolate fudge round sandwich cookies are going to satisfy any chocolate craving. 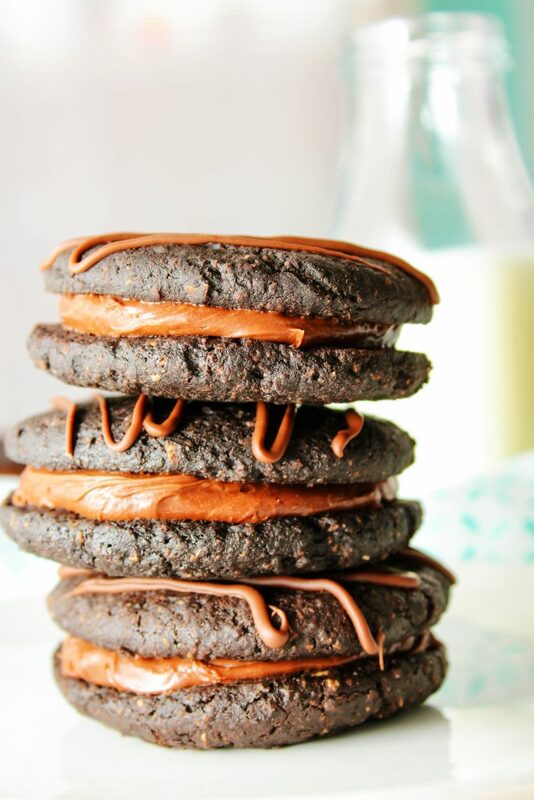 Rich and smooth chocolate creme sandwiched between two soft, chewy, fudgy chocolate cookies. 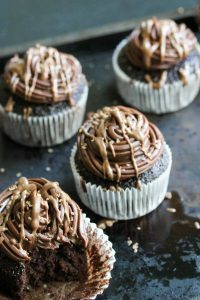 How many times can I mention chocolate in a one blog post!? Not enough, if you ask me. 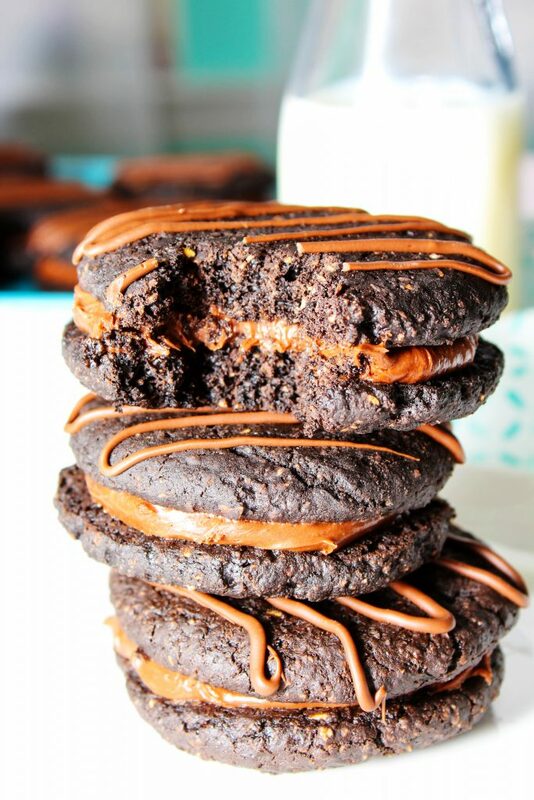 Chocolate fudge round sandwich cookies were a staple snack in my house growing up. It’s not very often my whole family likes the same food, but these were the exception. Fudgy, chocolate-y, delicious. Not much there not to like. Oh, wait, maybe the trans fats and empty calorie ingredients they’re made of? Why do bad for you things taste so good! Well, now good for you things can taste good, too! Like, seriously. When I was testing out this recipe I couldn’t believe how fudgy they were. My immediate thought was, “Did I accidentally use a chocolate bar instead of cocoa powder? Did I forget I already added the sweetener and add it twice?”. My mouth and tummy just couldn’t believe they were healthy. And it only got better from there because I stuffed a decadent chocolate creme in the middle. A creme that is made without trans fats, which are the worst type for your health. Instead, you’re getting unsaturated fats which can actually reduce the risk of heart disease. All thanks to the avocado used, which also gives the creme its, well, creaminess. And really, what IS creme without creaminess?? Also, avocados – what can’t they make better?? And as if these super mouth wateringly tasty and healthy chocolate fudge rounds couldn’t get any better, they’re also made in just one bowl. Any one else make a New Year resolution to do less dishes besides this girl? Well, let’s be real…that’s been my resolution for basically my whole life. The cookie portion of this dessert comes together in just a few minutes. Whisked together all the dry ingredients, then add the wet ingredients. It may seem like the mixture is too dry, but I promise it will come together. Don’t be afraid to get your hands in there, if needed. Once the dough is rolled into balls and placed on the baking tray, just use the same bowl to make the icing. No need to clean it in between. The cookies and the icing are both mouth wateringly chocolate, so there’s really no need to worry about unwanted cookie flavors affecting your creme. I mean, spread the chocolate love, am I right!? Then, spread a generous heaping of creme onto one cookie and top with a second cookie. Feel free to drizzle some melted chocolate on top for the full fudge round affect. But, if you aren’t going to serve them all right away (or eat them all yourself right away), it’d be best to store the cookies un-frosted and sandwich them when you’re ready to eat them. If you sandwich them together before storing them, the cookies could get too soggy. 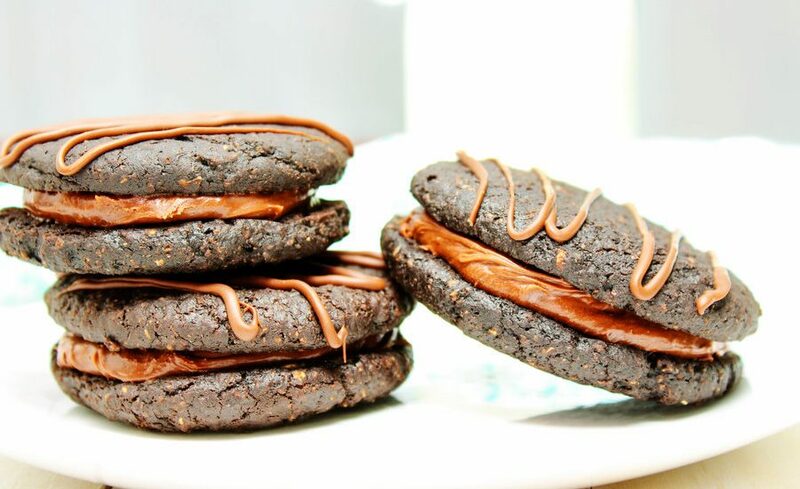 If you make these chocolate fudge round sandwich cookies, share it with me @HealthyHackRD. I love seeing your creations! Preheat the oven to 350 F. Line a cookie sheet tray with parchment paper (two trays if you have them) and grease the parchment. For the cookies: if making vegan cookies, mix together the flaxseed meal and water in a small bowl and set aside. In a large bowl, whisk together the flour, protein powder, cornstarch, cocoa, sweetener, baking soda, and salt. Add to the dry ingredients the yogurt, egg whites (or egg or flaxseed egg), sticky sweetener, and vanilla. Stir together until all the dry ingredients are incorporated. The dough will be thick and you want want to use your hands to ensure everything gets mixed together. Roll 1 1/2 Tbsp of dough into a ball. Place the dough on the prepared cookie tray. Using something with a flat bottom (like a glass), press the ball of dough out until it's about 1/4" thick. Repeat this process with the rest of the dough. You will be able to fit about 6-8 cookies on one tray. Bake for 9 minutes or until the edges of the cookies are firm to the touch and a toothpick inserted into the center of a cookie will come out with just barely any dough on it. Immediately transfer the cookies to a wire rack to cool. For the frosting: in a medium-sized bowl, add the tofu (don't press/squeeze out water from the tofu), sweetener, cocoa, avocado, and vanilla paste/extract. Spread the frosting evenly on bottom of one cookies and top it with a second cookie, squeezing the cookies together gently so they will stick together. 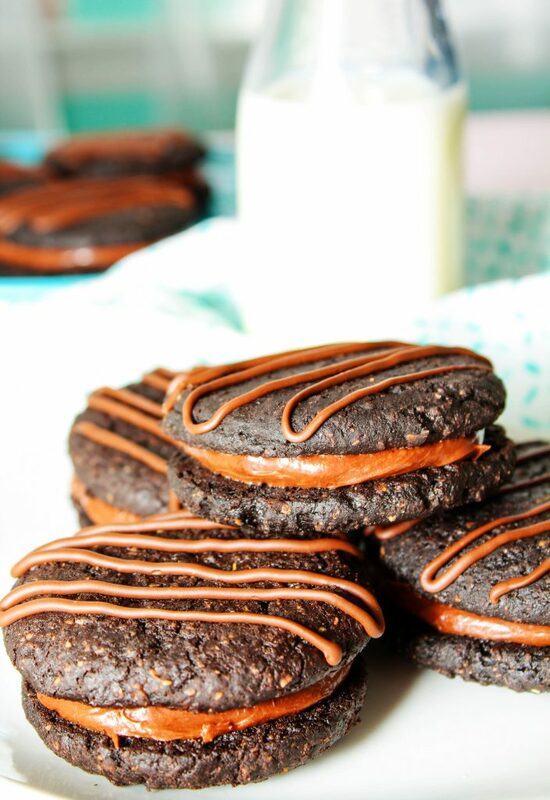 Happily snack away on your homemade, healthy fudge round cookies! These are my new favorite cookies in the world. I can't believe how low fat the cookie is because it's DELICIOUS. YUMMMMM. Thanks!! These say Vegan, but the yogurt and eggs alone make it not. Still a lit healthier than normal fudge rounds. Hey KP! 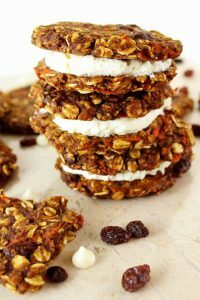 There is the vegan option in the recipe to use yogurt of your choice (any dairy free option) or a flax egg in place of the regular egg.